Please note the ​Priority Application Deadline for both programs has been EXTENDED to Sunday, February 10th. Late applications will be considered on a space-available basis until April 1. Part of the power of Hadar is the integrated, holistic aspect of life and study here. Hadar students and faculty daven together, share meals, study together, visit the sick together, and sing together. Those activities are not independent - our learning takes on the personal and soulful tones of davening, and our commitment to compassion to the elderly informs conversations within the yeshiva’s walls. 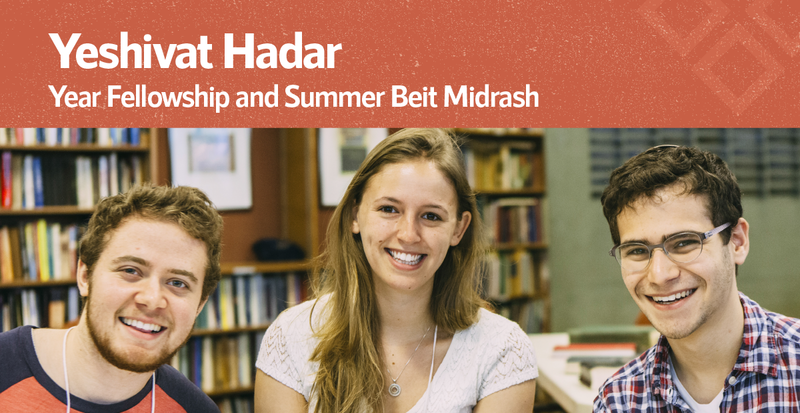 Being a member of the Hadar community is not just about your time in the Beit Midrash; it’s a way of life for a summer or year. Over the past decade, more than five hundred students have studied at Hadar, and are now pursuing careers in fields from medicine to economics, social work, and Jewish education. Hadar isn’t just about a summer or a year; it’s about joining a community that is working to create a new kind of Jewish community, one that will welcome you as a colleague and friend in the fullest modes of Jewish life. For more detailed information, see the Frequently Asked Questions.